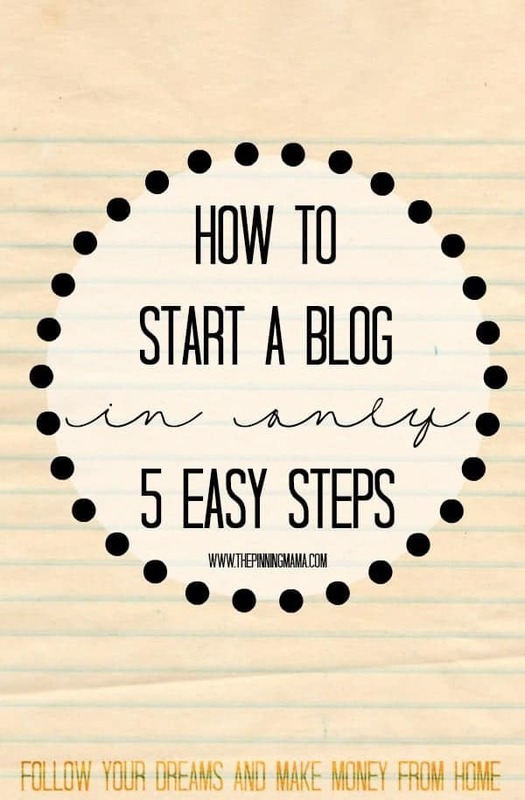 How to Start A Blog in Only 5 Easy Steps! My friends joke with me because during any given conversation or activity we might be doing, I will point out something they are doing well and tell them that they should start a blog about that! For me blogging has been a way that I can do something I love and create a steady and growing income stream for my family. It is something that is so SIMPLE and AFFORDABLE to do, that I really feel that EVERYONE should be doing it! Blogging for income isn’t like a magical unicorn – something you hear can be done, but you don’t actually know anyone real that can do it. Blogging is NOT a get rich quick scheme, but I firmly believe that anyone willing to put in the blood, sweat and tears can do it and make money! I help people and they thank me! You are your own boss, make your own hours, and decide what you want to do and the direction you want to go. Being on Pinterest is my job. Literally! There is something that provides overwhelmingly joy in creating something that grows and flourishes each day. If blogging has been a dream of yours, OR if you have been searching for a way that you can make money in spare time from home, then I encourage you to think about starting a blog! With a very small investment and very little technical knowledge you can be on your way to doing what you love and making money doing it! This post contains affiliate links to take you straight to the products I love and recommend! Picking a host is super easy (see below.) Picking a domain… not so much. The first thing you will want to do is figure out what your website will be called and pick a domain (ie www.thepinningmama.com.) This might not seem hard until you until you realize that most of the more common stuff is already taken. So get your thinking cap on and be creative. My advice is to come up with something that is descriptive of what your site will be about. You also want it to be as simple as possible so people can find it easily. Go here to check if the domain you want is available. Now that you have decided you will need someone to host your site! It is important to have a self hosted site if you want to make income with your blog. This means you own your site, content and all the hard work you put in completely belongs to you instead of WordPress, Blogger or someone else! It also means you can earn money though ads, affiliate income, sponsored content, and any other way you choose to! My heartfelt recommendation is to go with BLUEHOST for your hosting needs. Why? I originally signed up with them because they were recommended by WordPress themselves. Why I love them though is because I had ZERO technical knowledge, outside how to operate a computer and open the internet before I started a blog. Bluehost offers 24/7 technical support and literally walked me through every single step of setting my site up. The best part? They never made me feel like an idiot, although I am nearly certain that I absolutely sounded like one. If this sounds familiar, then Bluehost is definitely for you! They held my hand through things that weren’t really even their responsibility, their customer service really is just that good! The other reason to go with Bluehost is that they are ridiculously affordable. Especially considering how much support they give you. I had an entire year of hosting with site back up and a few other extras for under $100. What other business could you start with such a small investment? Again, Bluehost makes this super easy. You can watch this video from Bluehost on step by step how to get it installed in minutes! And if you have ANY questions, even if it is in the middle of the night, just call Bluehost 24/7 support and they will walk you through everything! Once you have wordpress installed on your site you can log into YOUR WEBSITE and start to make it your own! The way you change the look and feel of the site is by installing a theme. There are several free themes available through WordPress, but most bloggers choose to use an affordable theme like Foodie (one of my favorites!) because it offers a superior look and feel as well as support and updates. For a few extra dollars you can even have them do the set up for you so you don’t have to lift a finger to have it up and running. Now that your back end is all set up, all you have left to do is tell the world what is on your mind! After logging into your dashboard, click on posts in the left sidebar and add new. Type your heart out and when you are ready to share it with the world, hit publish! In just 5 steps you can go from dreaming about having a blog to publishing your first post. It really is that easy. I followed my dream and there has been nothing better than seeing the daily rewards of it. So scroll back up, start with step 1 and begin to make your dream come true too!